Showing horses can be nerve racking for those who don’t have much experience with it. It can sometimes create so much stress for some, they don’t even bother trying because of how overwhelming it can feel. At River Lane Ranch our trainers and owners understand how this feels and want to share all their knowledge about showing horses and more! Did you know there are several trade secrets that many trainers/owners won’t tell you? Are you aware of exactly what the judge will be looking for, regardless of what breed your showing? Do you understand feed and nutrition and why and what horses should eat to look and feel their best? How about grooming? It doesn’t just happen the day before the show. 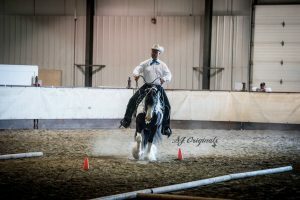 For those of you who want to show off your Gypsies to the world and feel confident and knowledgeable at your next show ..this No Secrets Show Clinic is designed just for you! Come have a fun, informative weekend at River Lane Ranch! Rich Zenner from CM Performance & Halter Horses is a world class showman. He knows exactly what it takes to get the job done and proves that each and every time, when he walks into the ring with a horse on the lead. We don’t now anyone else more passionate about showing horses then Rich. Rich has been showing at the worlds with AQHA & APHA horses for well over a decade. He is a horseman through and through, as he grew up as a child with horses as the primary focus in his family, he has horses in his blood. 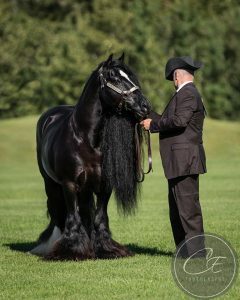 In 2017 Rich showed his first Gypsy Vanner at the Feather Horse Classic Nationals and has been hooked ever since! If you want to win at Halter and show off your horse so only the judge can see you, Rich can teach you how to get it done. After College Chris began working as the trainers assistant for Carol Rose Quarter Horses, the AQHA’s All-time leading Breeder of Performance Horses located in Gainesville Texas. During Chris’ 6 months in Texas he took advantage of the opportunity to ride and train with the likes of Michael Berg, Bobby Lewis, Carol Metcalfe, Tim McQuay & Tom Chown. In 1999, Chris began which would turn out to be 3+ years as head trainer for Gerold Dautzenburg owner/operator of Long View Ranch (LV Ranch) in Wilhelmsburg Austria. LV Ranch is a world-class show, training and breeding facility.While there, Chris trained and campaigned prospects, fine-tuned finish horses as well as coached youth and amateurs at home and at shows throughout Europe. Chris was fortunate enough to coach and compete in 3 European Championship Quarterhorse shows held annually in Kreuth Germany. Chris Miller has been training and showing Gypsy Vanners for River Lane Ranch since 2017. He quickly realized how unique the breed is and that it would require a different type of training. Adapting some of his own methods and creating some new ones specific for the Gypsy Vanner, Chris is proving that Gypsies are capable of anything! This 2-day clinic will help you …. Board – Free of Charge! The clinic starts at 10:00am and you can check in early as 9:00am. Outside paddocks are available for horses to be boarded at no charge. Enrollment is limited so register soon. Auditors are welcome for a $45.00 fee for the entire weekend. Questions welcome. Please fill out the form and send an e-Transfer payment in full to info@riverlaneranch.com to confirm your spot. Spot not guaranteed until clinic money is received. Please select which options you would like and be sure to send your e-transfer to confirm your spot or call (780)952-1593 to pay by credit card. Join River Lane Ranch's Mailing List?